The ideal winter getaway spot, Four Seasons is just a quick hop to Split Rock Resort or Big Boulder Ski Resort. And if you don't feel like skiing, there's always H20 Indoor Water Park and much more. The light, airy, home has a 650 sq. ft. raised deck with a Weber gas grill, and a table with seating for 10. Also, outside is a cozy, 8 person hot tub. Inside, enjoy the fireplace, pool table, comfy seating for watching TV, a lovely kitchen with breakfast bar seating, and wireless Internet. Come vacation with us! 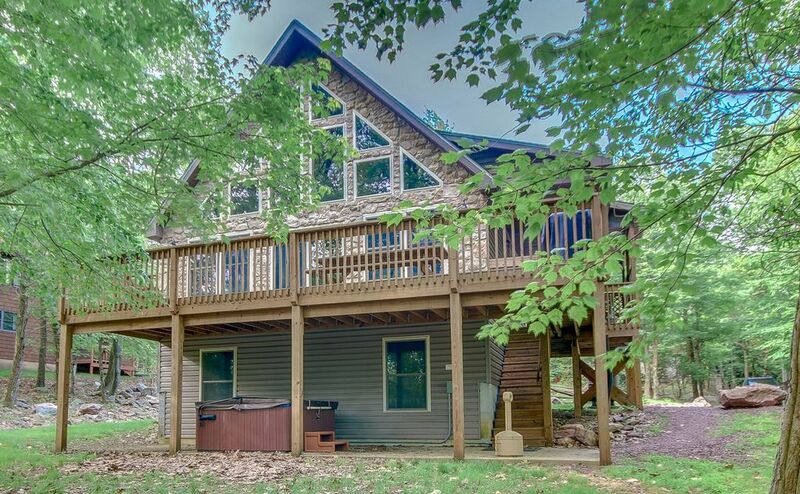 Pocono Mountain Rentals provides full service property management and guest services to the vacation rental communities of Lake Harmony, Split Rock, Towamensing Trails, Brier Crest Woods and Laurel Woods Communities. We put our guests first. We partner with upscale vacation property owners who care as much about the quality of their homes as we do about the entire guest experience. Our guest services office is located in the village of Lake Harmony and only minutes from our homes. Four Seasons was perfect for our group. 4 couples looking to ski and snow tube at Jack Frost. Four Seasons was clean, plenty of room and wide open "living" space. The 2 bedrooms and 1 bath room on all 3 floors was great. Kitchen and dining area was well used by us all. I would recommend this house for families and groups. Property manager was fantastic and extremely helpful. Great house for a summer getaway. The day before we were scheduled to go away for the weekend, I got a call from the landlord saying that we could no longer stay there. With 10 people coming from out of town for the weekend away, we had to scramble quickly. I called Pocono Mountain Rentals the morning of check in asking if they had any properties available. They luckily did, and they all did an amazing job of getting us into the house at the original check in time. Once we got there, the house was great. Friday night was raining, but there is enough to do in the house to keep everyone entertained. Bars, and restaurants are a quick drive or walk away, and it's a great little town. We would definitely stay at this house, or any other property again. The stay was awesome. Home was extremely clean, activities in the area were minutes away. Highly recommended! Had a blast with friends. Slightly unhappy with cleanliness, but was with very low maintenance people so we did not make a fuss (shower liners had mildew, mold in bathroom). House has no amenities, unless paid for or brought, which is difficult for a weekend trip. Basics should be included (toilet paper, cleaning products). View was amazing. We really enjoyed the layout of the house. We did think it would be closer to the lake than it was. The main living space was great for our group. When we ran the dishwasher, it leaked some water, and one of the toilets leaked as well. The downstairs shower curtain had a ton of mildew on it, and needs to be replaced. Overall, it was a great group house, it just had a few cleanliness and maintenance issues. We rented this cabin for my best friend's bachelor party. It was the perfect size for the 13 guys that were there. Everyone had a place to sleep, the deck was great for grilling and hanging out, and the location was excellent. Overall fantastic experience.